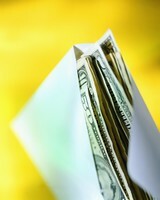 The Cash Budget Envelope System is a great way to gain control of your spending and save you money! Dump the Debit Card-Cash is Smarter! In this world of debit cards, the use of cash to pay for everyday items has significantly declined. Most people find it easier to swipe that card than to keep cash on hand. Research shows, however, that when we use a debit or credit card, rather than cash, we tend to spend 12%-18% more! Simply put, it hurts more to hand over cash than it does to swipe the card. Therefore, we are more likely to be conservative spenders and smart shoppers if we are paying with cash. And that will help us stay within our budget! 1. Decide which categories of your budget will be converted to the cash budget. You can combine categories in the way that works best for you. For example, you might include money for all the things you would buy at the grocery store into one envelope, instead of separating it out into food, toiletries, cosmetics, etc. Gather the number of envelopes that you need and get them labeled in a way that works for you. 3. When you get paid, cash a check to fill your envelopes. Check your budget first to determine how much cash you will need from that paycheck. Then go by the bank and cash a check for that amount. Make sure you ask for the denominations you need, so you can put the correct amount in each envelope. Cash Budget Envelope System works? 1. Put a little more than you think you will need for the first couple of months. We usually spend more than we think we do on things like food and gas. Put a little more than you think you will spend in these categories the first couple of months. You can evaluate your spending at the end of the month and adjust your amounts as needed. You definitely don’t want to come up short on money for food and gas. 2. Don’t borrow from other envelopes when one is empty. You’re trying to stick to a budget. If you run out of money in one envelope, that means you’re done spending in that category until you get paid again. If you’re continuously coming up short in a certain category, re-evaluate your budget and put more money into that category from now on. If you leave the house without your envelopes and decide to go out to eat, go back home and get your envelopes. Don’t use that debit card! You’ll mess up your budget! 4. Evaluate your cash budget spending each month when you do your budget. Compare your actual cash spending with your budget to see how you did. Make any necessary changes to next month’s budget so you can stay on track. The Cash Budget Envelope System may take a little getting used to, but it will be well worth it. Just remember, you’re making a lifestyle change that will better the financial condition of your family from now on.